The mirror is an accessory that dates back to around 2000 BC. It has assumed numerous shapes and uses depending on the period and the decorative style at that time. Designer mirrors were always intended to be refined as they are synonymous with vanity.They were also the height of design as a decorative and luxury object. In medieval times, one of the oldest and most widely-used mirrors of the time, was made of tin, which resulted in a very prosperous trade in this metal. Gold and silversmiths nevertheless produced models with precious ornaments to order for the aristocracy, thus making designer mirrors a real gem. During the Renaissance, Italy held the monopoly in glass mirrors, overthrowing the reign of precious metal mirrors, and creating a vogue effect across Europe. The qualities of Italian designer mirrors stemmed from the exceptional skills and savoir faire of Murano glass blowers, who also mastered the art of covering glass and metal to create a limpid and stunning mirror. These models were characterised by their very straight geometric shapes and often bevelled edges, while the frames were made of moulded metal or sometimes walnut veneer. In the 16th Century, the distant fore-runner of French glass manufacturer Saint-Gobain was the royal manufactory that produced the glass of Louis XIV's Hall of Mirrors at Versailles. The first French designer mirrors were thus created and they are now in situ in many Parisian apartments, very often set on mantelpieces, bringing light and perspective to a reception room and decorating the walls with a frame of dark wood or gilded wood moulded with a flower garland pattern. Neo-classical style started to make its mark in the 18th Century and and designer mirrors were simplified until they became rectilinear. The decoration of the frame was now confined to a border of pearls or several small sober details. Starting from the second half of the 19th Century, designer mirrors began to be used by a broader swathe of the population and came in many more shapes; free standing mirrors, toilet mirrors, or even so called oeil de boeuf (bulls-eye) mirrors. Production became industrialised and mirrors available to all classes, while remaining an essential decorative object and proof of good taste. Nowadays, decorative object designers play with the idea of the mirror to make it one of the key pieces in an interior. In addition to illuminating and giving more volume to a room, the mirror effect adds depth and design style, in all living spaces. 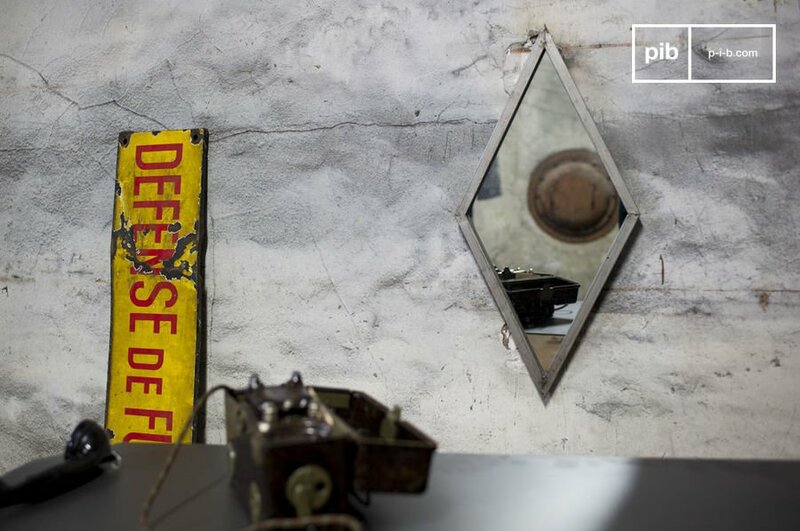 Vintage designer mirrors are now sought after for their cachet which goes perfectly with a modern interior.